The Chase Hospitality Group has made quick service food a little more refined. 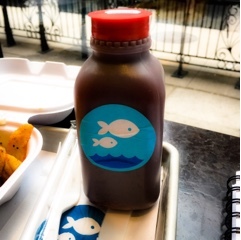 Little Fin, located a few steps off Yonge on Temperance is conveniently located for the Bay Street crowd. Meals aren’t inexpensive, but is lower than their sister restaurant – Chase Oyster and Fish. Moreover, the portion sizes are generous. 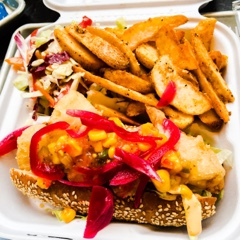 The calamari po’ boy sandwich ($11) arrived brimming with hot freshly fried crisp calamari pieces, crunchy lettuce and various condiments – creamy Thousand Island, sweet corn relish and pickled red onions. The sesame studded bun didn’t stand a chance at containing all the ingredients, so protect yourself with a napkin. Tons of seasoned potato wedges (well flavoured but could be crispier) and a delicious vinaigrette based coleslaw (loved the horseradish like kick) fills the container. 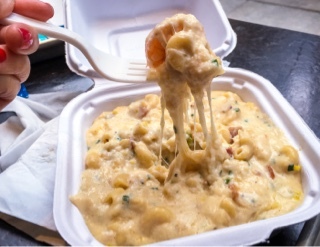 If you’re fond of gooey cheese, Little Fin’s shrimp mac ‘n’ cheese ($13) will not disappoint: every forkful reveals long strands of white cheddar. This dish is full of flavour with pieces of smoky pork belly thrown in for good measure. I was impressed by the number of grilled shrimp mixed throughout, they certainly weren’t hard to find. If only there was more macaroni and the pasta wasn’t cooked so long it’d be even better; the noodles were too soft and became lost amongst the ingredients. The thick sauce was actually great for slathering over bread, so share this with someone having a sandwich and borrow a piece of their fluffy bun. Little Fin also treated me to one of their fresh pressed juices ($3), an apple raspberry blend. Normally, I refrain from juices as they’re overly sugary. However, Little Fin’s must be naturally flavoured as it was no sweeter than having an apple. The raspberry seeds remaining at the bottom was a telltale sign that the juice was actually made with fruit. The restaurant’s prime location and catering service makes Little Fin great for office lunches - indeed, during my visit they were busy preparing for a large party order. 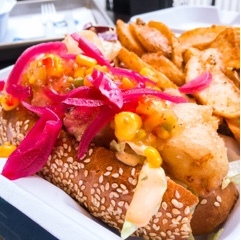 After all, who needs another boring deli sandwich, when you can have a hot satisfying po’ boy instead? Disclaimer: the above meal was complimentary. Rest assured, as noted in the mission statement, I will always provide my honest opinion.